Wishing everybody a Happy Thanksgiving with some of our students' fun and Thanksgiving-themed art projects! Where is your city located? What is its water source? What structures does your city have? What resources does it need to protect? Then students studied the structures of ancient Rome and each one of them picked a building to research, write a paper about and recreate as a model. Now we have a magnificent mini Rome in our atrium! "Music is children's first patterning experience and helps engage them in mathematics even when they don't recognize the activities as mathematics." Concepts of math can been seen in various ways throughout our classroom for 4-year-olds. Each day, the children are working with numbers, patterns, and relationships. 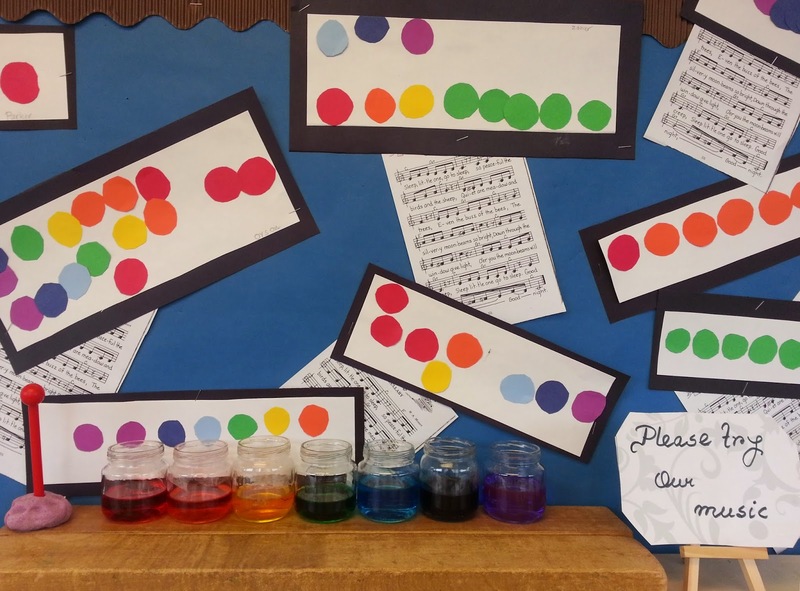 Having just learned about primary colors and the colors of the rainbow, the children explored mathematics by using color patterns to write music. Patterns and rhythm were captured using the seven colors of the rainbow. With liquid watercolors, matching colored paper circles and small glass jars as materials, the children set out to write their own music, playing it back on the jars filled with colored water. Each child created a unique song. Some used colors to create a pattern, others varied the tempo while palying the music on the jars. And the most amazing thing? Someone else, like a teacher or classmate, could "read" their music and play it back as well! Thus they had not only created music, they'd also "written" it. What a simple way to introduce the idea of transmitting information using symbols, the very basic concept of literacy.